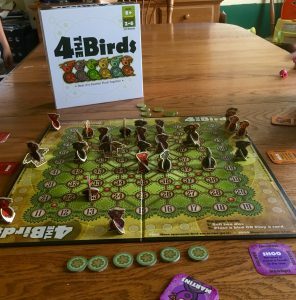 4 The Birds is a family board game that is a wonderfully designed classic lineup game (think Connect4 but allowing squares as well). It was designed by Steve Ewoldt and illustrated by Ben Crenshaw. 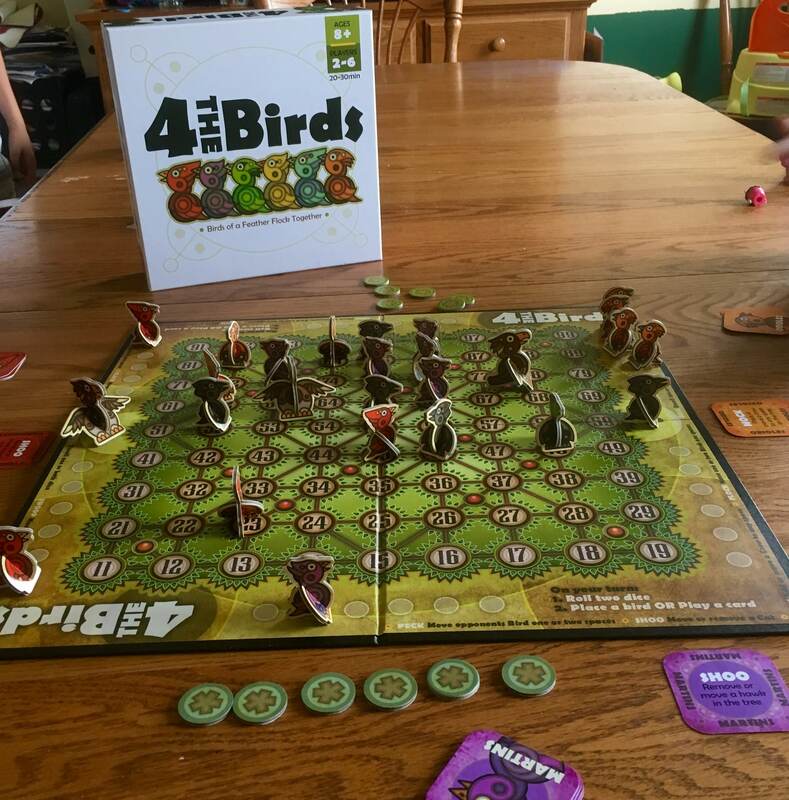 This game is easy to learn and fun to play and has unique elements like a ‘pecking order’ among birds, non-player crows and hawks that scatter the flock, and 6 action cards that allow players to manipulate gameplay. The components are gorgeous. The artwork and aesthetic (much like Breaking Games’ Letter Tycoon) really add to the overall appeal of the game. The colorful birds are reminiscent of a stained glass window with some celtic flair. The tree on the game board has an intricate pattern that is a bit complicated, but beautiful. The box interior is not particularly well laid out and if you are bothered by everything getting jumbled up, definitely consider getting tiny zip top snack bags to make organization easier. At first glance, the game board and number of pieces seem overwhelming. However, this is a one of those games where it is a good idea to just play and work out the mechanics as you go. Once you get in a round or two, it is becomes clear and is very simple to play. Each player rolls two dice on their turn to determine where they will place their bird on the tree. The tree on the game board has a grid with numbers within circles. If a player rolls a 4 and a 2, they get to choose if they place their bird on the 24 spot or the 42 spot. When placing birds, territorial disputes are resolved via a fun mechanic called a “Pecking Order” and there is slide mechanic that goes into effect when birds vie for the same spot on the board. If a player chooses not to place a bird they can play one of their 6 action cards instead. These cards allow you to disrupt an opponent’s strategy or save you if you get stuck. Non-player birds (crows and hawks) add unique obstacles as well as chain-reaction board-reorganizing, sliding, and scattering. The ultimate goal is to be the first player to get 4 birds in a row or in a square on the grid. This is a great game that is fast and easy to learn and play. It has elements of strategy as well as some elements that rely on simple luck. There is hidden learning to be had here beyond the numbers and the spatial reasoning. While playing, our children got into discussions about the different species of birds, where they live, and why crows and hawks were the “villains” in the game. As for overall playability, this one falls middle of the road for us. Our younger children had trouble moving pieces around and a bit of difficulty distinguishing which way to slide and which birds they could move. The recommended minimum age seems fairly accurate. Kids younger than 8 can certainly play the game if they are savvy game players and can handle using their fine motor skills to manipulate pawns on a crowded board. However, be aware that even older players can knock over pieces on the crowded game board with a tiny bit of clumsiness while playing. One small recommendation is to avoid having the red and orange birds out at the same time if you can. They are really hard to tell apart in poor light. This is a gorgeous family board game that can be enjoyed by new gamers, casual gamers and experienced gamers alike. Because the game strategy is familiar, but includes a few unique twists, we really enjoy it. Our children often choose to bring this to the table to teach new friends how to play. And, so far it has managed to not become dry or stale. While the game doesn’t have the inherent EXCITEMENT level of some of the more popular gateway games, the adults we introduced the game to enjoyed themselves. The price point of $40 is similar to other games like it and is worth it considering the quality of the components. You should definitely consider adding this game to your game shelf!